Last month I read an article about Clip-Air, a concept for a new modular aircraft. Clip-Air would separate the wings from the fuselage so that body of the plane could be loaded with passengers or cargo anywhere — like a bus station or train depot — and then driven to the wings for takeoff. Even more cool is that up to three passenger or cargo units could be attached to one set of wings! This new idea in aviation engineering was on my mind as I planned my visit to the Early Start program of Jubilee Youth Services in Washington, DC. Jubilee Youth Services is part of Jubilee Housing, a faith based non-profit organization founded in 1973 that provides affordable housing and supportive services to some 800 economically disadvantaged residents of the Adams Morgan neighborhood. As a special guest reader to the K-2 students in Early Start, I wanted to contribute to the STEM learning fun they’d been having all summer. And I wanted to talk about cool airplanes. Here’s how a concept for a new aircraft inspired a morning of laughter, learning, and some very loopy planes. 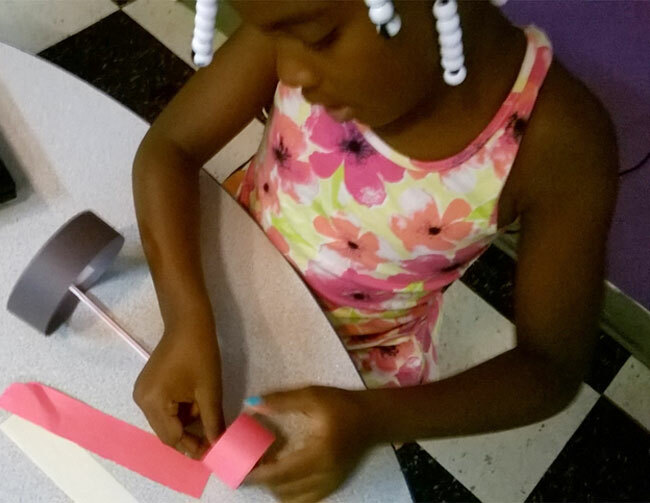 For summer learning programs, Start with a Book offers many excellent ideas for powering up read aloud sessions and activating imaginations with hands-on activities. I decided to take advantage of the Reading Adventure Packs which offer suggestions for fiction and nonfiction titles and hands-on activities around kid-friendly themes, including Flight! Since I am into airplanes, I already had a nonfiction book in mind and on hand: Into the Air: An Illustrated Timeline of Flight by Ryan Ann Hunter. I love this book as a nonfiction read aloud because it offers a very simple narrative, but wonderfully detailed illustrated insets that make up the fact-filled timeline. For fiction about flight, I choose The Adventures of Sparrowboy by Brian Pinkney, which is a masterfully illustrated tale of a newspaper delivery boy who magically and mysteriously receives the power of flight when he nearly collides with a sparrow. The Flight Reading Adventure Pack suggests making and experimenting with paper airplanes as an activity, including building an unusual loopy model. All I needed was paper, straws, and tape. And kids’ imaginations! I knew I had an imaginative bunch at Early Start when we sat down to chat before reading. 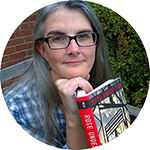 When asked about their summer adventures, I heard about trips to the pool and amusement park, but also about drawing and writing their own books — about haunted houses. Our conversation moved very naturally from talking about summer activities to taking vacations to flying somewhere far away in an airplane. Before we even started reading we talked about the Clip-Air (yay! ), the job of an aviation engineer, and other jobs related to airplanes and airports. And no one was shy about sharing their ideas about flight while we read Into the Air: An Illustrated Timeline of Flight. This title turned out to be a wonderful choice. The kids had a lot to say and a lot of questions about the illustrations. Rather than read every word and every timeline inset, we read and talked about the ones that caught their attention. The designs of the aircraft featured at the end of the book are very unusual and really fired kids’ imaginations. We decided to take advantage of that excitement and move right to making planes rather than reading The Adventures of Sparrowboy. Everyone was able to follow the simple instructions and fairly soon there were loopy planes in flight! Some kids felt like a plane should have wings and wanted to make the design their own. Everyone went back to the tables to work on their modifications. Test flights were taking place all over the room, so we decided to see how everyone’s plane measured up. 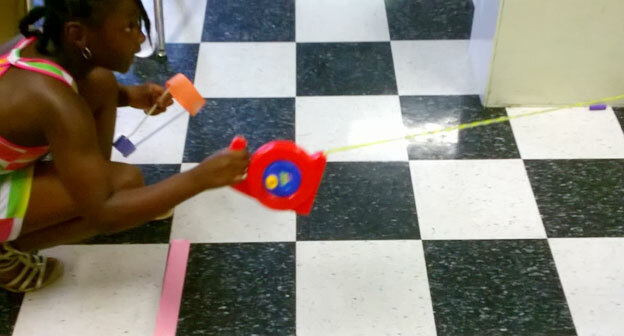 We put a starting line mark on the floor and everyone had a turn launching their plane across the room. We taped strips of paper on the floor to mark distance and declare a winner! That one plane went the farthest wasn’t enough information for some students though. They found a tape measure and measured from the starting line to the winner’s mark: 116 inches! Some students wanted to compete again, so we had some more modifications and another round. While some kids started cleaning up after that flight, there were others who were decorating their planes or trying to work out how to add seat belts for toy animals. Engineers at work! After everyone put their planes away, each student got to pick a new STEM-themed book to take home. If only I’d had more titles about airplanes! 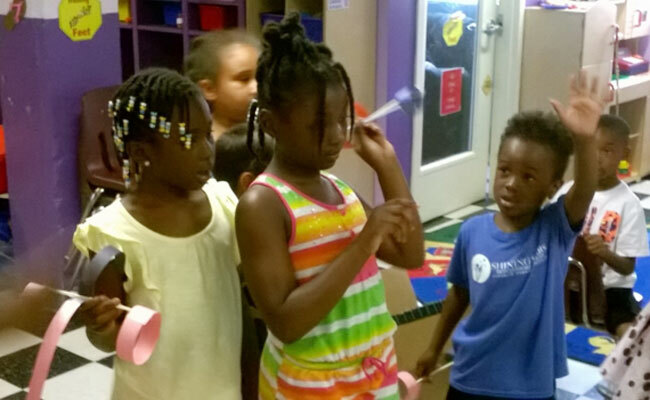 Audrey Walker, the program coordinator for Early Start, has used Start with a Book resources in her summer classroom to plan activities and find book suggestions and is planning to incorporate some of the ideas into their afterschool program this year. She sees great benefit and value in having young kids moving around and learning at the same time. I’m looking forward to continuing to help her students reach new heights, with or without wings.